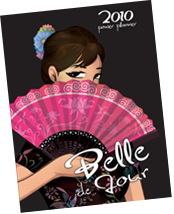 I just sent my reservation for the Belle De Jour (BDJ) Power Planner. For the ladies who are not yet familiar with it (and is still struggling to complete a Starbucks coupon to get a free planner), time to check out the BDJ. It is a chic planner with tips and articles about lifestyle, career, health, love, fashion and travel. It even comes with 10,000 thousand worth of discount coupons and freebies. It is a bargain at Php599. But early birds (like me), will get a 5% discount and free shipping delivery if you will reserve a copy now. I did reserve for my 2009 planner because of my worry to miss another copy. The 2008 planner was sold out, even in Powerbooks and National Bookstore. Check out Belle De Jour website to order one now! You may want to participate on their event on October 25th at the Eastwood City.